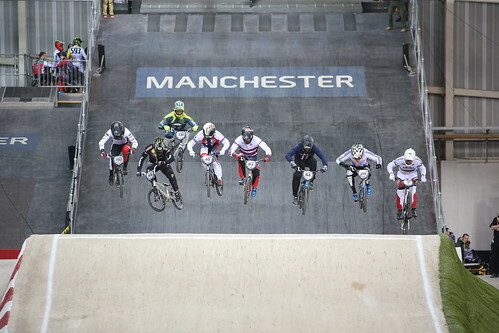 Liam Phillips won a fourth consecutive UCI BMX Supercross World Cup in Manchester as Kyle Evans completed a one-two for the Great Britain Cycling Team. The 27-year-old defending world cup champion took the holeshot from gate three in the final to extend his record-breaking run at the National Cycling Centre. Evans, 22, added further jubilation as he followed Phillips across the line to take his first ever world cup podium. “I can’t stress how hard that was, it was by far most challenging day of racing I’ve had in a very long time," Phillips said. "Some days you’ve got tough it out and try and make it to that last eight and once you do that it’s anybody’s game. Evans and Phillips had delivered an identical result in the semi-final, after Tre Whyte had just missed out in the quarter-finals and Quillan Isidore exited in the 1/18 finals after crashing on the first turn. In the women’s competition, British Cycling Junior Academy rider Bethany Shriever, aged 16, reached the semi-finals in a fantastic debut on the UCI BMX Supercross World Cup circuit. Shriever nearly reached the final but was edged into fifth place as only the top four progressed. Australian Caroline Buchanan won a dramatic women's final as Alise Post crashed in the final 10 metres having led for the entire race.